The Federal Government said it has located a foreign account used by the Indigenous People of Biafra (IPOB) to receive slush funds from some Nigerians abroad supporting the group's agitation. The account, with huge deposits, was discovered in Paris, France, The Nation quoted security source sources to have said. Some IPOB members were also said to have invaded Nigerian embassies in Hong Kong and Spain in the last 72 hours on the pretense that they wanted to renew their passports but ended up staging protests. The Minister of Information and Culture, Lai Mohammed, had earlier accused the British and French government of aiding the pro-Biafra group led by Nnamdi Kanu. 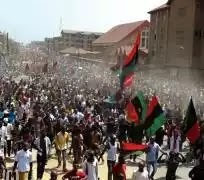 The Federal High Court in Abuja had also given judicial backing to the executive order of President Muhammadu Buhari, outlawing the Indigenous People of Biafra and its activities in every part of Nigeria. However, French Ambassador to Nigeria, Mr. Denys Gauer on Friday met with the Lai Mohammed over the country's alleged link with IPOB. Gauer was said to have assured the Federal Government that France would not support any terrorist group. Reports said that the French government promised to take action as soon as the IPOB’s slush account was known to it. "Intelligence gathering has led to the discovery of an account in Paris into which some Nigerians in the Diaspora remit funds to support IPOB," a top security source said. "From the said account, funds were being drawn for the activities of IPOB at home and abroad. The relevant security agencies did a thorough job and provided incontrovertible evidence on the basis of which the government proscribed the terrorist organisation. "These Nigerians in the Diaspora are using France as a clearing house. "Investigations also confirmed inflows into the account from Holland, Hungary, Hong Kong, Malaysia, Turkey, Singapore and other parts of Europe. "In fact, a football tournament was recently organised in Senegal to raise funds for IPOB. "As a matter of fact, the account is being used to get money from a lot of people in the Diaspora. "What many Nigerians did not know is that the Minister of Information and Culture was talking on the basis of credible intelligence report." The source said the government will soon obtain a list of all the people remitting funds into the account in Paris.